How Old Should My Puppy Be Before They Hike? 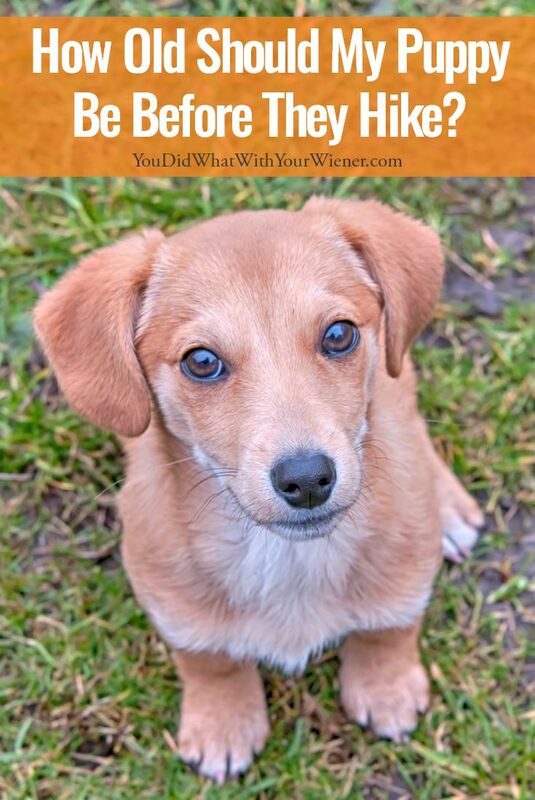 You are here: Home / Hiking & Camping Tips / How Old Should My Puppy Be Before They Hike? You wanted a hiking buddy with lots of energy and that was always excited to go when you are so you got a puppy. You can’t wait to hit the trails with your new pup and introduce them to a life of adventure. But should you? Puppies shouldn’t go on substantial hikes until their bodies have fully matured. This article is about hiking with your puppy but the same information applies whether you want to go on long walks with your puppy, running with your puppy, or have your puppy participate in any kind of physical exercise. So how old should your puppy be before they start hiking? At What Age is it Safe for Puppies to Hike? Your young, sprightly pup is full of energy, and sure to be your closest adventure buddy in years to come. But don’t head to the trails just yet – long and steep hikes are not suitable for young puppies. You need to take into consideration your pup’s age, size, breed and health before you start going on those big adventures. In your pup’s first year of life, their limbs will grow longer. While your pup is still growing, they’re at risk for growth plate injuries. Growth plates are soft regions at the end of your pup’s bones that harden as they finish growing. These growth plates are vulnerable to damage from over-exercise and trauma. The exact age at which your dog is ready for intense hikes will vary. Growth plate injuries that occur before your pup is eight months old tend to be the most devastating, and may result in deformities that require surgery. Dogs are vulnerable as long as they are still growing, which can be one year old for small dogs, and 18 months for large dogs. It’s best to ask for your veterinarian’s professional opinion on when your puppy is ready to hike. Growth plate injuries can be acute – caused by some kind of trauma – while chronic injuries are caused by long-term strain on the joints. Besides hiking, they can also suffer growth plate injuries from normal activities like playing, going up or down stairs, and jumping off furniture. Signs of bone growth plate injuries include swelling, pain, limping, stiffness and abnormal growth. These are good to know even if you don’t take your puppy on long hikes. You’ll need to see your vet about any mild symptoms that last longer than a few hours, or immediately in cases of trauma or severe pain. What Activities ARE Safe For Puppies? Hiking, fence-running, agility, and even playing with older dogs can be considered “forced exercise” because your puppy may overexert itself trying to keep up. When your puppy is still growing, it’s best to stick to activities that do not exceed the exercise level they would get from playing with other puppies. A few laps around your local park, or a brief walk in a wooded area, can be good ways to introduce your puppy to the concept of hiking without much risk. Avoid difficult terrains, and lift your puppy in and out of the car (don’t let them jump out on their own). As your puppy approaches a year of age, you can begin taking very brief hikes. You don’t only have to worry about growth plate injuries. Overexertion, dehydration, heat stroke and muscle tears are all possible side effects of hiking, especially if you don’t gradually work your way up to long hikes in rough terrain. Take frequent breaks, even if your dog doesn’t seem tired, and look for signs that they’ve hiked too far – but aim to stop long before that point. While your pup is still growing, you can focus on training so they’ll be well mannered for their first hike as a grown dog. This will give YOU something to focus on too so you aren’t tempted to push them too far too fast. Walking on a loose leash. An excited young dog can spoil a hike by constantly pulling ahead. Start in a low-distraction environment like your backyard, and focus on getting your dog to walk by your side. 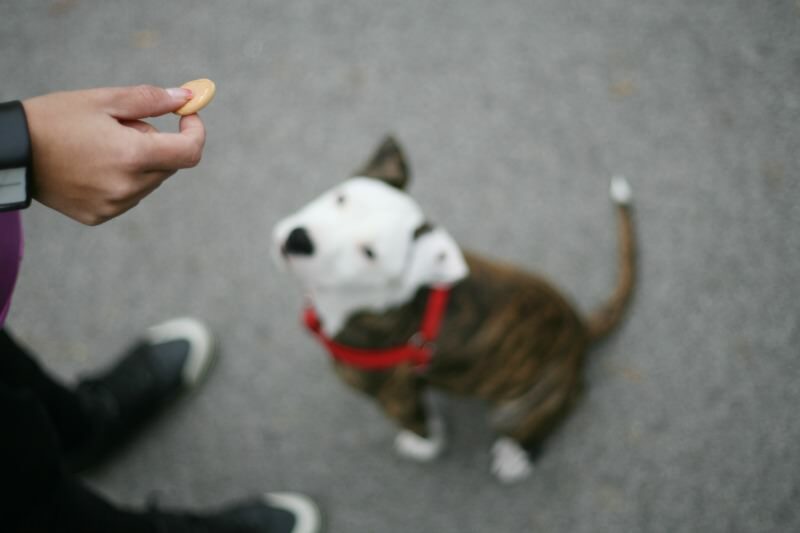 You can use the Silky Leash Method, stopping when your dog pulls, then rewarding them when they leave slack on the leash by giving them a treat or picking up the speed. Not grabbing everything they find. There’s lots of cool finds on hiking trails – sticks, leaves, abandoned snack food, poop, dead animals – some of which can make your dog sick if they’re not trained to leave it. A strong recall. It’s safest to keep your dog on a 6-foot leash when hiking. However, they can slip out of their harness, or your leash could break. Or, you may even eventually want to allow your dog off-leash in safe areas where dogs are permitted to be loose. In the meantime, practice recall every day until your dog responds to your whistle or call, even in high-distraction areas. Politely greeting other dogs. It’s not necessary to let your dog say hello to every other dog you see on the trail. But you’re inevitably going to run into off-leash dogs, so it’s good to socialize your puppy so they’re comfortable with random greetings. When your dog is on leash but the other dog is not, it can be stressful because your dog has no choice but to have another dog in their face. Keep meetings brief and attempt to keep your dog’s focus on you. It’s more important to be comfortable than for them to learn they must tolerate situations that stress them out. If you have a little patience, and focus on light exercise and training while they are still a puppy, you’ll have a fit and well mannered trail dog in no time. This weekend gone I took my pup out for his first hike (and mine, too…) and he handled it really well. Most of the climb he spent rummaging around around like a little mountain goat. Some great tips here to get your pup ready for this first and many more hikes. We do need to work more on leave it. Bo’s favorite part of hiking is to eat All. The. Sticks. Off to read more of your posts! This is a great post. My parents recently adopted a new pup and we were just taking about this the other day. We have done several short hikes on easy terrain already, but are leaving the long hikes until she is a little older. Thanks for the good information. Kala and I are avid hikers but we eased into it once she reached maturity. Even after all this time and loads of experience I take great care that she gets lots of rest and “pit stops” along the way, and that we have all the necessary equipment for anything that may befall us on the trail. I absolutelly agree that these kinds of activities aren’t healthy for your puppy and his/hers still developing body no matter how light the chosen trail seems to you. Be patient and work on your socialization and obedience skills as a necessary foundation for the good times to come. Thank you for bringing this up! Even the old rule of five minutes per month of age is no longer accepted. Puppies need to play in “bursts” which is not hiking or even walking. Better to wait than risk permanent damage!